Mixon Fruit Farms in Bradenton is a farm owned and run by the Mixon family since 1939. This is a little different farm because it not only has the coolest gift shop selling everything from citrus to homemade fudge to wine, it also has an animal sanctuary where it keeps rescued animals, making this a destination spot, especially for families. We discovered this place through Groupon, where it was offering a deal for an hour-long tram tour and ice cream for two. When we pulled up the farm, we discovered it to be much more than what we expected. We decided to do the tour first, so we hopped on the tram and waited for our tour guide. She took us through the fruit farms, where they harvest all different kinds of lemons, oranges and grapefruits. She pointed out the Mixon’s house, which is right on the property. They have a wide variety of citrus they grow on the farm, more than just an orange grove. There was even a tree that had been grafted to grow three different types of citrus on one tree. I had no idea trees could do that. The second par t of the tour took us to the Wildlife Refuge where we got out to see the animals. 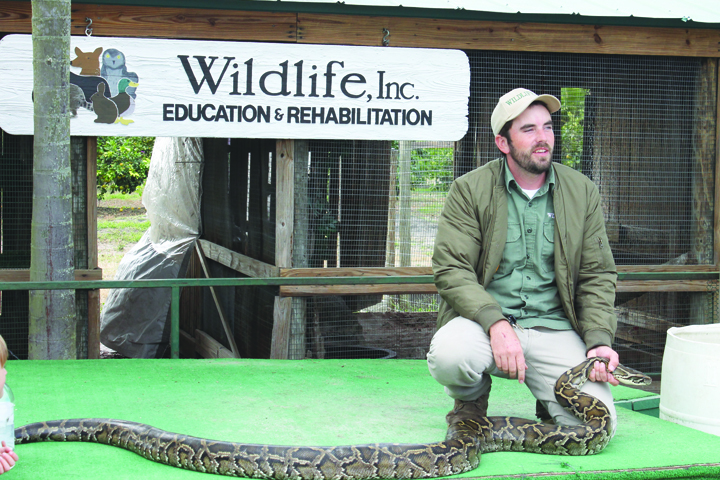 The owners of Mixon Farms, Dean and Janet, share a portion of their citrus grove with Wildlife Inc., where is serves as a Florida Wildlife Care and Education Center. They provide land and shelter for orphaned and injured birds, animals and reptiles. Some animals are rehabilitated and released back into the wild, and some are permanent residents. The first thing we saw was Damen, the animal handler, standing in the cage built for the rescued Nile Crocodiles. He explained that they were so still because of the chilly weather, so he was able to move around them more freely. There were four crocodiles in the cage with him. This was a man who clearly had no fear of animals. He told us a story about how one of the owls had tore his cheek open with its talons once. The other animals we saw were J.J. the pig who you can feed treats to, a falcon, baby alligator, skunk, a pair of raccoons, a pair of owls, a python and tortoise. He brings out some of the animals, like the tortoise, python, skunk and baby alligator for people to pet if they choose to. That was probably the first and last time I will ever pet a skunk. But the main purpose of Damon showcasing the animals was to inform people how exotic animals shouldn’t be taken in as pets unless the owners are committed to take care of them regardless of how old or big they may get. I believe quite a few of the animals in that shelter were pets at one point. The tram tours are daily at 11 a.m., 1 p.m. and 3 p.m. and last about an hour. It cost $10 for adults and $5 for children ages 3-12, and children under 3 are free. Group tours are welcome with a reservation. After the tour, we headed inside the store to get our ice cream. Walking around with our orange and vanilla swirl we tasted homemade fudge, popcorn and wine. We picked out some fresh fruit to buy and looked around at all of the gifts they offered. The store also has a Groveside Café where you can have lunch or snacks. They let you sample the wine for free before you pick out a bottle. Their fruits are featured in a few local wineries and they had a wide selection of wines to choose from. They host festivals and can be booked for events and weddings. There’s even a cute butterfly garden out front and tons of photo opportunities. Mixon Fruit Farms is located at 2525 27th St. E. in Bradenton and is open 10 a.m.-5 p.m. Monday through Saturday and are closed Sundays. Visit www.mixon.com.